Introducing Lauren Tovey Our Trainee Paralegal! 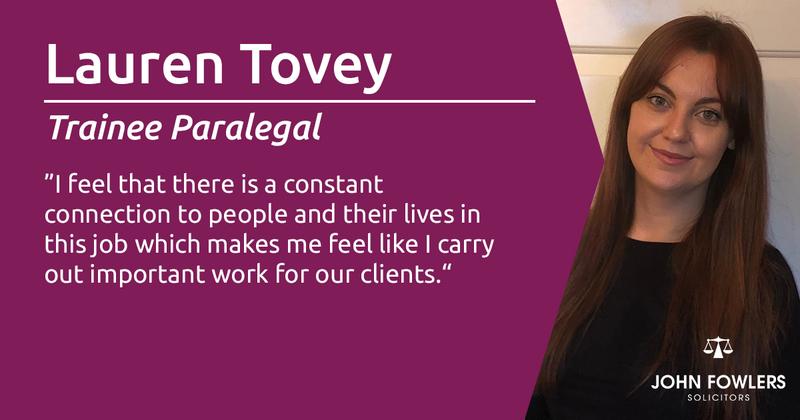 Meet our Trainee Paralegal Lauren Tovey! Find out everything she needed to know on her journey into her law career and everything she has learnt so far! Introducing Lauren Tovey our Trainee Paralegal in Colchester! Lauren will be joining us at the University of Essex on Thursday the 15th November to meet with others also looking to pursue a career in Law and answer any questions you may have! What interested you in a career in Law? What interested me in a career in Law is that you come into contact with Law every day, whether you know it or not. It is such a significant aspect of our society and daily life. At one point or another, you will need a Solicitor or other legal professionals, whether that be in order to buy a house or to create a will. It is an important area and function of our society which is why I was drawn to studying the subject at both A Levels and University. What does your day at John Fowlers consist of? Every day is different at John Fowlers, there is always something new to learn. In the morning I get given various jobs to be completed in the day which I work my way through throughout the day. The exciting part of this is that no two jobs are the same, there is always something different to do! I enjoy this variety as it means I am constantly learning. I can go from working on the sale or purchase of one house to the sale or purchase of a plot of land with multiple houses. It is interesting to see how the different areas of the business, namely Commercial and Conveyance Law combine. What have you learnt from working at John Fowlers? I have learnt more of the practical side of Law at John Fowlers. You really do not know what it’s like to work in Law until you experience it firsthand; it’s very different from other jobs! Aside from learning how to put the law into practice, I have learnt how a professional firm is run and the day-to-day aspects of the firm. What do you enjoy the most about working in Law? What I enjoy most about working is Law is working so closely with people in matters that everyone encounters in their life, such as buying a house. I feel that there is a constant connection to people and their lives in this job which makes me feel like I carry out important work for our clients. What piece of advice would you give to someone who is looking to pursue a career in Law? The advice I would give to someone pursuing a career in Law is to try their best to get experience. I think experience is key in the legal profession! It can be very difficult finding an opportunity but be persistent. Practicing the Law is so different to learning the Law and so having experience in this area is really beneficial when going on to look for training contracts or other various legal jobs. If you're seeking an opportunity to shine within the legal industry and would like to learn from our local law firm, get in touch with us! Our solicitors in Colchester and other surrounding areas, deliver innovative, expert legal advice to individuals, families and businesses. Speak to us if you have any questions.